Carnival Grocery is a Lincoln Park classic. The traditional corner store sells meats, produce, bakery items and wine to thousands of Lincoln Park residents the old fashioned way – within walking distance of their homes. Established in the 1930s at half its current size, Carnival was purchased by George and Cynthia Costas in the 1950s and sold to its current owner, Arthur Paris, in 2000. The Costas family expanded the store, and after George passed in the early 1990s, his three children ran the business for about 10 years. George’s wife, Cynthia Costas, was a teacher at Lincoln Park High School, making the entire family heavily invested in the neighborhood. The murals on the exterior walls of the store were painted by muralist Romano Maschietto, who was commissioned by the City to do several large public murals around the city. As a dramatic aside, Mascietto was stabbed by his daughter in his Bridgeport studio in 1994. At the age of 24, Arthur Paris purchased John’s Finer Foods in Old Town in 1996. Four years later, he purchased Carnival from the Costas family. After selling John’s, in 2011, he renovated the store, opening up the floor plan, installing all new refrigeration and moving the meat department to the front. His investment paid off in 18 months as his customers approved of the upgrades. 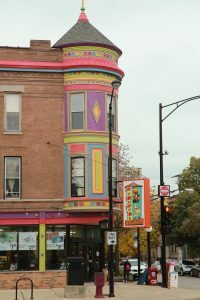 Though Paris has received several generous offers to purchase his building in the past several years, he has declined, stating that he is dedicated to the grocery business, and could not easily recreate the charming setting and welcoming atmosphere at Carnival that has proven so successful among his clientele. Mr. Paris enjoyed his best year ever at Carnival last year, and that was certainly enhanced by the arrival of a new baby girl, who is now one. A resident of Wrigleyville, Paris commends the neighbors of the Mid-North neighborhood for helping make it such a great place to live. Paris is currently searching for ideas to replace the murals that once graced the exterior of the building and have become weather worn. He encourages anyone with ideas for a design or fundraising to contact him in the office.